'Summer' is one of the most popular works in the collection, a virtuoso performance in watercolour. The searing heat of summertime almost obliterates the hills in the distance and penetrates through the tall gum trees that offer the sheep below restful shade. 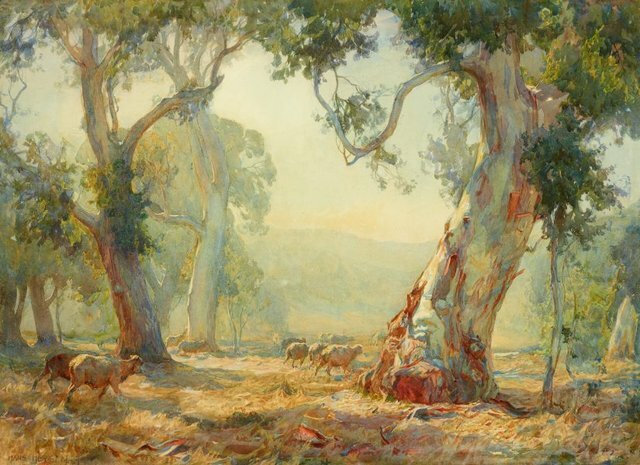 Heysen's mastery of draughtsmanship provided a sure foundation for his watercolours that remain among the best of his generation. This painting won the Wynne Prize in 1909 and was acquired by the Gallery in 1909. Signed and dated l.l. corner, brown watercolour "HANS HEYSEN 1909".